Red House Chalet and Caravan Park01692 650815work Holiday ParkRed House Chalet and Caravan Park is a peaceful, family run park set in 2 acres with beautiful sea views and direct private access to a tranquil sandy beach. Chalets and caravan holiday homes, the majority with double glazing and central heating, available for sale and hire. Licensed bar with dartboard, pool table and Wi-Fi (seasonal opening) on site laundry. Excellent location to visit Norfolk Broads, Cromer, Norwich, Great Yarmouth and many local attractions. Only a few minutes’ walk to Bacton village. Red House Chalet and Caravan Park is a peaceful, family run park set in 2 acres with beautiful sea views and direct private access to a tranquil sandy beach. 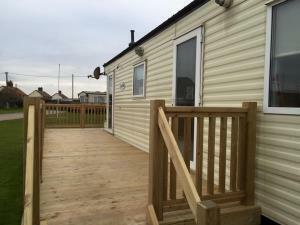 Chalets and caravan holiday homes, the majority with double glazing and central heating, available for sale and hire. Licensed bar with dartboard, pool table and Wi-Fi (seasonal opening) on site laundry. Excellent location to visit Norfolk Broads, Cromer, Norwich, Great Yarmouth and many local attractions. Only a few minutes’ walk to Bacton village. Facilities for children: Travel Cots available. Children welcome from any age.